Learn how to make a place mat for your dog's dishes with this fun project from Wendy Nan Reese. Each mat is large enough for several bowls, so you'll never have to worry about spills from your pet's food and water bowls again. I always have the same problem. Four dogs live in my house, so feeding and watering time can get messy. I live in a two-story cottage in Los Angeles, where it can get very hot. I always keep two fresh bowls of water upstairs in the kitchen on the tile floor, and two bowls of fresh water downstairs on a hardwood floor. Now I'd like to tell you that I've trained all four of my dogs not to slobber and drip water, but the truth is, God Bless them, watering my boys is the biggest mess. I tried putting towels under the water bowls, but those just got wet and dirty by the end of the day. So, what did I come up with? Plastic place mats, and they were great. Now you can buy plastic place mats for very little money at any Target®, Bed Bath & Beyond® or dollar store, but finding plastic place mats large enough to accommodate two large bowls at a time is harder than you think. Unfortunately, I could never find a really cute place mat that matched my kitchen, my downstairs, or even my personality. So you know me, I decided to make my own. I can't tell you that they are as inexpensive as you can get at the dollar store, but what I can tell you is they will look pretty, and they'll last a long time. If you have two-legged children, this could be a fun rainy day project. You can turn their original artwork into a plastic place mat. Heck, you can even give your four-legged kids a try. If your children will be creating the artwork, turn them loose with the paint and canvas or paper. If your dogs will be the artists, move the project outdoors. Use some masking tape to tape your paper or canvas to the ground. 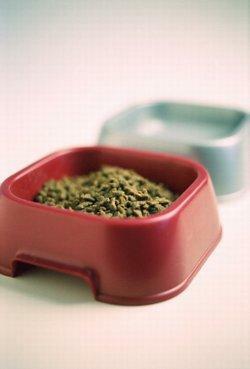 Put some paint in a couple of bowls, dip one or two of your dog's paws in it, and let him roam across the mat. You can repeat this step with any other of your dogs that want in on the fun. Once the painting is completed, let the project dry. Your next step will be to glue the ribbon trim all the way around the outside edge of the mat with the roll-on glue stick and let it dry. Once your place mat is dry, you're ready to preserve it in plastic. I like to take my mats to Kinko's® where they put my decorated fabric or paper through a huge laminating machine. This is my hands-down favorite way to go. It lasts the longest, and it makes the place mat water and food tight. I've also tried sealing the mat myself using a food sealer. I buy the plastic material for the sealer in a large roll that lets you create exactly the size you want. I start at the top and place my fabric inside the plastic bag. Then I seal all four sides. The food sealer works well because it takes all the air out before the heat element seals the bag closed. This is my second favorite method. Once you've made one of these mats, you'll never go back to store-bought plastic mats again. They are incredibly useful, and once you experience the convenience of the 36x36 inch size, you'll be spoiled for anything less. Each mat can become a fun conversation piece in your home, and the designs are only limited by your imagination. Your friends will certainly be entertained by the art work whether it's from your two-legged or four-legged kids!